Pt Mollie: When was the last time you accidentally ran a marathon? When was the last time you accidentally ran a marathon? After 1st lap. On my 2nd cookie. On Wednesday, I accidentally ran a marathon. Accidentally probably isn't the right word. Maybe unexpectedly is more appropriate? 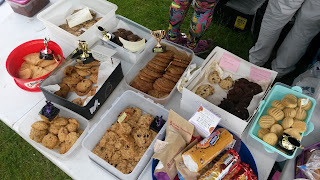 My friend, Lucy, (we ran Mill Hill Marathon together) and I set out to take part in Saxons, Vikings, and Normans (SVN) Cookie-a-Thon. 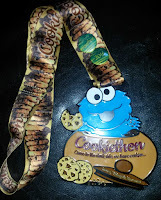 The course was a 5.36 mile loop with lots of cookies in between each lap. I had 6 miles to do according to my Berlin marathon training plan from Hal Higdon. Lucy had been toying with the idea of running 100 marathons but wasn't planning on it when the starting bell went off. We decided we were aiming for a half marathon and then would see how we feel. It was an early start for both Lucy and I as the race was in Challock, Kent. We both left our homes by 6am and she picked me up from the Ebbsfleet International train station. I didn't fuel properly in the days leading up to the race and didn't get much sleep the night before so I was unsure how I would feel on the day. I did 90 of spinning both Monday and Tuesday nights meaning I wasn't physically rested either. I was also worried about injury. If my Achilles tendinitis, plantar facisitis, or periformis pains started acting up again, I would be really cross with myself. But the gang at SVN are so incredibly friendly it is hard not to have a good time when you are at one of their events (we had previously attended their Unusual Suspects challenge in February). We had a late start due to the toilet queue but set out on the trails only a few minutes late. We weren't worried though because the time limit was eight hours. I found the course to be hilly (1500+ feet elevation change according to Strava). There were some bits in the sun and some in the shaded wood which was nice. The weather was a bit funny, as half the time it was raining and the other half the sun was out. 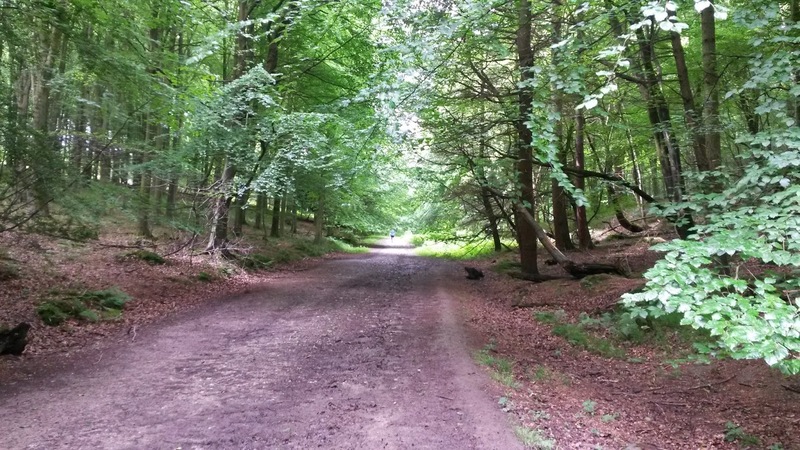 Bit of the course through the Forestry Commission park we ran in. We aimed to run the first two laps and would then use a walk/run strategy if we were going to continue. Lucy's stomach was bothering her so we did walk a little bit on the first two laps. For the next lap, we decided to walk uphills. We didn't stick to a specific time or distance interval when breaking up the final three laps between walking and running. We listened to our bodies and tried to get around. Many of the participants were doing the same and we had a good chat with them too. Lucy learned what 'Quest for the Vest' is and declared she is out to be part of the 100 marathon club. 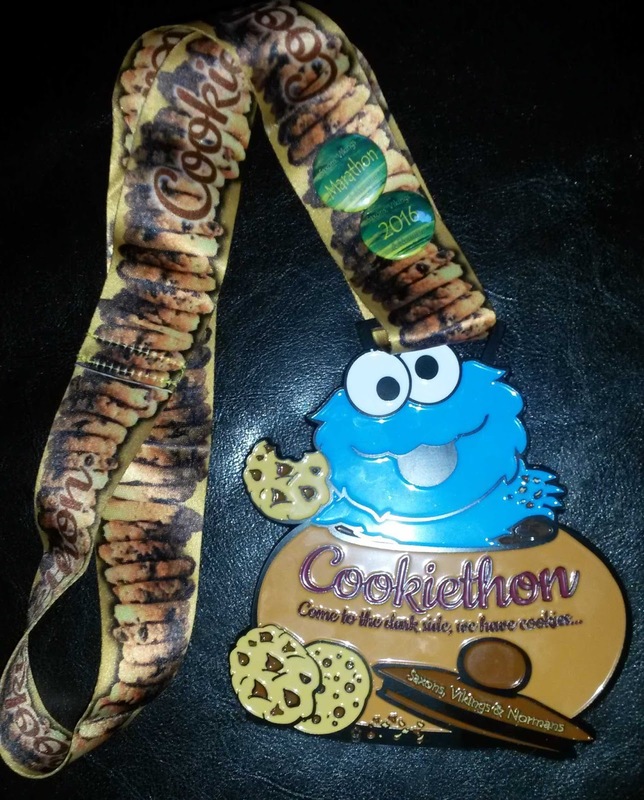 Part of the Cookie-A-Thon was runners bringing in cookies. Awards were given out for best cookie, best cookie with peanut butter cookie, best vegan cookie and best cookie with chocolate. The SVN community is very inclusive. Everyone on the trails is friendly and encouraging other runners as they pass. There are many smiling volunteers supporting the event and Travis, the co-founder & chairman of 100 Marathon Club, walked the route backwards and chatted with each runner as they went passed. It was an amazing feeling as we set off on our last lap because we knew we were going to have completed another marathon. We took inspiration from Lucy's daughter, who isn't a runner, yet managed 15 miles at the Unusual Suspects event. It gets to the point in the 'race' (not the best word in this case due the to community-feel that is more akin to parkrun) where it is more mental. When you take away the pressure to run all 26.2 miles and you don't have masses of people passing you, it is very freeing. It was my 3rd marathon and Lucy's 9th. The bling is amazing (so heavy I couldn't wear it while I was stretching out). We spent a lot of time stretching after we finished and talking to some of the people who ran ultras that day. I was a bit stiff that evening but today my legs felt alright. I must still be delirious because I signed up to run the Virgin Money London Marathon in 2017 with Plantlife today. 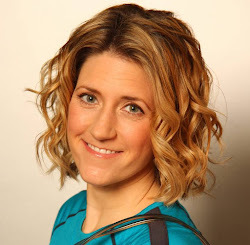 Instead of running 100 marathons, I am aiming to run the World Marathon Majors courses (I have always wanted to do a race in every state and as many countries as possible. I have a long ways to go). 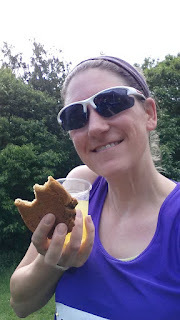 If you love running, and eating, I highly recommend you become involved with the SVN community. You will not regret it. If you have run any of the Major races, please leave a comment below with your favourite memories of the race. I have Berlin in September and will need to work on the rest in 2017 and beyond. You never know, Elle. If you are with good friends and there is sunshine, you might just go for it! It's surprising what you can do sometimes! My mum did this race too and surprised herself with how many laps she did. An SVN race is on my to run list as I've only heard good things about them and the medals always look fab. I am quite possibly using you as inspiration this weekend! Doing Rat Race Runstock - 8hours of 5k laps and possibly going to attempt a marathon maybe depending on how I feel!